We’re buying our own home. We need your help. After more than eight years of gathering, serving and sharing the love of Jesus in the East Village as a portable community, we are buying our own space. The time has come for us to become permanent residents of the East Village. We know, it sounds a bit wild. And it is. But as we relaunch Trinity Grace Church East Village this year we also believe God has invited us by faith to purchase our own venue and move from portable to permanent. And we can't do it without your help. We're buying Condo #1 at 418 E 11th Street, which equals 6,600 square feet of zoned religious and community use space. The purchase price is $2.2m with zero interest for 5 years. Our first fundraising goal is $350,000 for the downpayment, closing fees and initial rehab costs to get the space setup for maximum use. Obviously the more we can raise the better we can take advantage of the miraculous terms of this deal. Here’s how the money breaks down. To join us on this incredible adventure click the Give Now button below and follow the prompts to give through our secure Pushpay platform. You can also give and share thru our Gofundme page. Thank you in advance! *If we don’t reach our goal all funds donated will go toward the continued mission of Trinity Grace Church East Village. 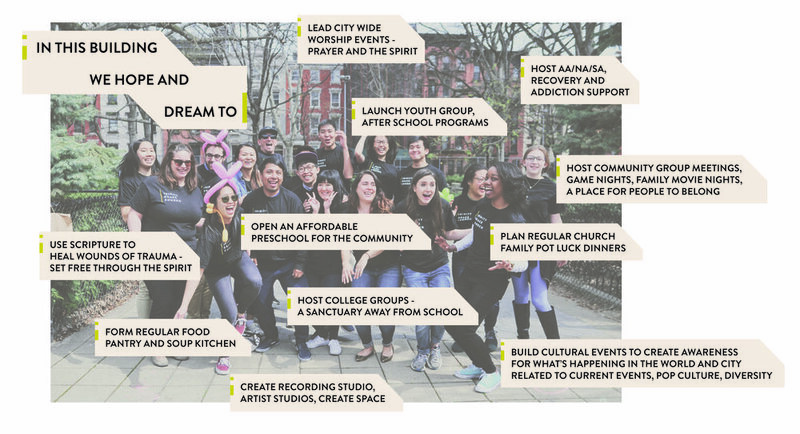 It all started when a small group of people gathered in the Wasko’s apartment to pray and begin dreaming together about what a new faith community in the East Village could look like. That was the fall of 2009. 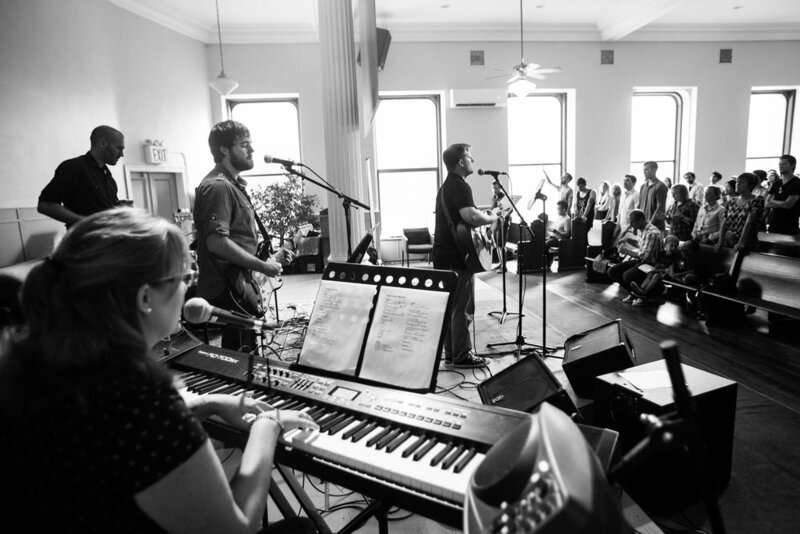 January 2010 launched our missional community at Citylight on E 7th Street followed a week later by a move to the Ukranian church in Cooper Square. Our gatherings moved to Theatre for the New City in September of 2014. March 2017 took us to Eastside Community High School and continued growth. Each new space allowed us new solutions while also presenting different challenges for storage, set up, and tear down of portable gatherings. Through these years we've been committed to seeing part of heaven come to earth as we join Jesus in renewing all things. This mission hasn't changed, but in fact, we believe we're more ready now than ever before to lay a new foundation and impact the East Village, New York City and the world in profound ways as we move from portable to permanent. Each year we average over 5000 volunteer hours to unload, set up, tear down, and pack away our infrastructure for each gathering. Owning property in New York City has always been a dream. But it's always been just that...a huge dream. Real estate values have always put owning something out of reach, aside from a miracle. In a city like New York, where very few people choose to stay forever, we're stepping up, putting down roots and saying we're here to stay. That miracle began for us just over a year ago when we were introduced to the owners of the property. They liked us and we like them and a relationship began and here we are, courageously believing that God is in this. 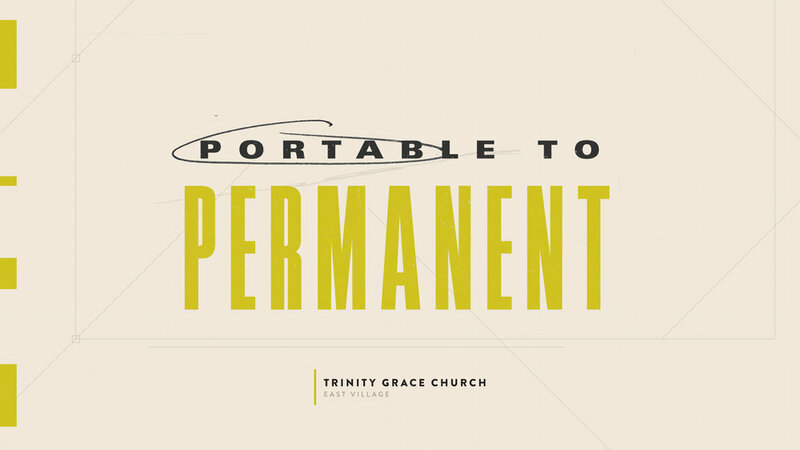 Trinity Grace Church East Village is precisely the kind of faith community that the sellers have been dreaming of and praying would be the next owners of this strategically located property. With a permanent venue we'll be seen by long term New Yorker's as legitimate, better able to serve the community, less vulnerable to the fluctuations in the real estate market of NYC, leverage income potential thru short and long term rentals and redirect invaluable volunteer resources from setup and tear down needs, toward serving our neighbors better. We can't wait to see what God does with this space. How many lives will be changed because this community believed by faith and courageously said yes to this invitation. This is the challenge before us. This is the invitation. Will you join us? Help us move from portable to permanent and be part of renewing the East Village of New York City!